Thank you for such a wonderful semester ! Over the past few months, I have learned so much about Mathematics, the Russian culture, and Moscow. I will remember this experience for many years to come. 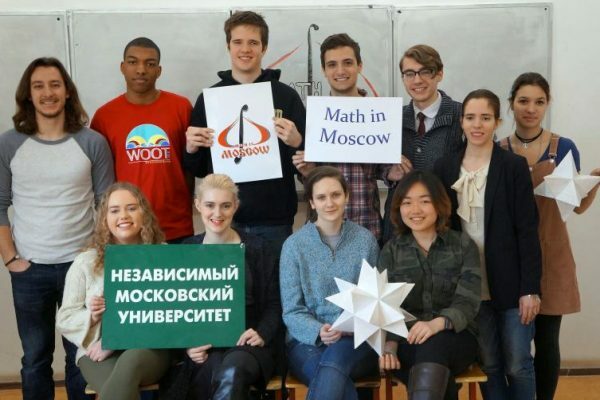 The Math in Moscow was such a wonderful study abroad experience ! I learned an enormous amount of very interesting mathematics and am very grateful to have had this experience. This semester I learned a ton about Russian culture and history. I enjoyed the experience and my personalized mathematics courses. This environment definitely helped me grow as a person and as a student and mathematician. The second semester in MiM gave me an opportunity to enjoy more the cultural and mathematical life in Moscow. I focused on more specific topics, but I had also the chance to widen my interests and knowledge in different areas.I recommend students to consider staging 2 semesters to appreciate more life in Russia. This study abroad was an amazing experience ! The math courses are taught by amazing professors who are very knowledgeable in their field and who care about each student. Moscow is a beautiful city with so much to do and traveling around Russia is absolutely wonderful. This program has so much to offer and is a great life experience. The courses here are very advanced undergraduate and beginning graduate level courses. The courses have solidified my knowledge and feel I am now well-prepared for graduate school. The small class sizes are unlike those in the United States. There are so many cultural opportunities in Moscow and I had so many great experiences. I am very happy that I chose to spend a semester in Moscow ! I had a great experience this semester, I learned a lot about Moscow, and Russian food, literature and culture. The math courses were fantastic. I really appreciated my opportunity to interact with the professors one-on-one, and learned a lot of very interesting math. I’ll always remember my time in Moscow fondly and i hope to return soon. This semester was truly a wonderful experience culturally and mathematically ! It was a wonderful chance to explore deeply the Russian language and the city of Moscow in a way I never would have had the opportunity to. Working so closely with professors and students who genuinely have interest and care for the material at hand was a wonderful experience. Спасибо большое ! I really enjoyed the time being in Moscow. The professors here are all very interesting and the lectures are inspiring, especially due to the fact that our class size is extremely small. One can form very good relations with profs and develop any specific topics in depth if desired. Я люблю Москву.